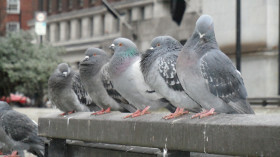 A large, growing group of pigeons have infested Washington County and are causing officials to worry about the health and well-being of its population. Before the population and visitors get sick from bird droppings, the town is brainstorming ways to fix the pigeon infestation without harming birds or the environment. Preserving the Largest Catholic Church in the U.S.
Todd Larson on Happy Halloween! Katie @ Bird Control on Bird strikes, left and right! © 2013 BirdMaster | All Rights Reserved.